Vision Care Consultants is one of only a few practices in the country to have this exciting break-thru technology. Thanks to our doctors being involved with the research and development of this contact lens design, we can now offer our patients this exciting new technology. 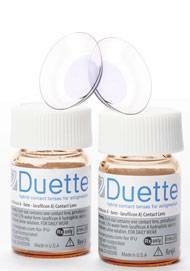 Duette™ is the perfect choice for patients with astigmatism seeking better vision and more comfort in a contact lens. The Duette™ hybrid contact lens successfully combines the best technical features of soft and Rigid Gas Permeable contact lenses in a new state-of-the-art product. 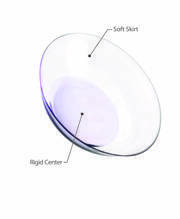 Soft contact lenses can compromise crisp vision while rigid lenses can be less comfortable and unstable on the eye. With Duette™ hybrid lenses, the “breathable” rigid center promotes corneal health and delivers high-definition vision, even at night, while the surrounding soft portion of the lens provides comfort and stability all day long.Duette™ is free from “toric lens rotation”, a common problem associated with some soft toric lenses that causes inconsistent vision. Duette ™ optics remain stable, delivering consistently clear vision – blink after blink. Duette™ eliminates the problem of irritating debris that can collect under conventional rigid lenses. And you won’t experience the annoyance of rigid lenses moving when you blink or dislodging with your active lifestyle.UV Protection: Duette™ hybrid contact lens has been approved at a Class II UV Blocking contact lens with more than 80% of UVA and greater than 90% of UVB being blocked from entering your eye while wearing Duette™. The sun’s UV rays have been linked to development of cataracts and macular degeneration in the eyes. Patients with nearsightedness, farsightedness and most types of astigmatism. Soft toric contact lens wearers desiring more consistent vision and improved clarity of vision both day and night. Rigid Gas Permeable contact lens wearers looking for improved comfort and elimination of those irritating dust particles that can get underneath standard gas permeable contact lenses. Patients with an active lifestyle or athletes that require the stable, pristine vision of rigid optics but cannot tolerate lens dislodgement or excessive movement of their contact lenses. Previous contact lens wearers who quit wearing lenses due to discomfort, less-than-optimal vision, night vision problems or instability on the eye. Set up an appointment today with one of our doctors to see if Duette™ is the best contact lens for you.